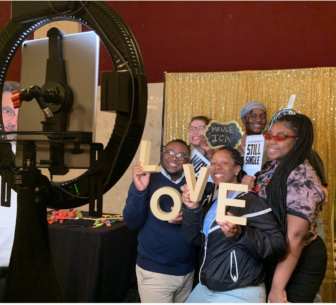 MSU students getting their photo taken at the pride kick-off event on April 1 in the MSU Ballroom. Students celebrated and socialized with different LGBTQ+ groups around campus. East Lansing students and residents are coming together to celebrate the LGBTQ+ community. On April 1, a kick-off was hosted in the MSU Ballroom. Representatives from many campus groups attended the event, including curators from the MSU Library. Elisa Landaverde, metadata librarian, became responsible for the LGBTQ+ Special Collection in 2018. “My interest is to expand what we have to be more inclusive,” she explained. In Landaverde’s eyes, the library’s collection doesn’t include enough current issues and people of color or less widely accepted members of the community. The library attempted to address this lack of representation by hosting a Trans Day of Visibility event on March 31. To many, the collection’s need for diversity reflects media representation and societal perceptions of the community in general. There are several groups across Michigan State’s campus that serve to provide a space for these underrepresented groups. One group called Color me Queer was represented at the kick-off by its assistant director, Oprah Revish. As she explained, Color me Queer is a space for queer students of color to discuss issues that come at the intersection of LGBT and race. Revish also outlined the history of pride and its significance. This June is the 50th anniversary of the Stonewall Riots in New York City’s Greenwich Village, the revolutionary event that Pride Month will be centered around. What is often overlooked about the riots and the LGBTQ+ rights movement is the crucial role played by queer people of color, particularly trans black women. Even in East Lansing, the first community in the nation to enact civil rights protections for gay and lesbian people, some see a lack of representation and inclusive policies. According to Human Resources Director Shelli Neumann, the city also began providing health care benefits to gay and lesbian employees and their partners far before federal laws required it. Neumann also described resources in her department for members of the community to reach out in cases of injustice. However, no policies or initiatives addressed the experience of queer people of color. Pride month celebrations on campus aim to be inclusive as possible. Drag queens, veterans, healthcare professionals, people of color and more will have events throughout the month. To see full details on upcoming events, check out the MSU calendar. Kayla Effner is a junior at Michigan State University studying journalism. She has taken interest in journalism since she was the Editor-in-chief of the Williamston High School Newspaper. Effner also has experience in editorial writing as a member of the Women's Fashion Team at VIM Magazine and in content creation as a volunteer at the student radio station, The Impact 89 FM. She plans to graduate in May of 2020.